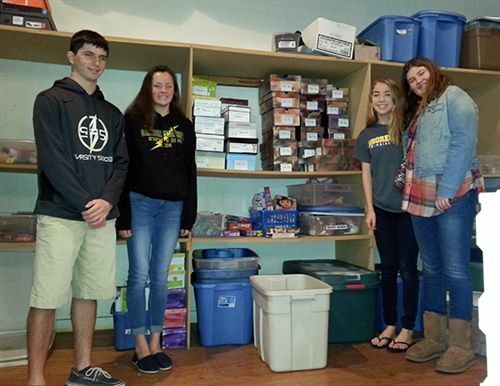 On February 21, Key Club Members Jimmy T., Hannah B., Alyssa F. and Millie A. along with Ms. Morlando visited the Pilgrim Congregational United Church of Christ to help fill shoeboxes with necessities for children who have been removed from their homes by Child Protective Services. These children will receive an age-appropriate box filled with items that include a toothpaste, a toothbrush, comb/brush, shampoo, conditioner, lotion, an activity book/reading book, playing cards, a stuffed toy, ect. to take with them when they are placed in foster care. During this visit the group also helped relocate empty shoeboxes from the second floor storage area of the church to the packing area. They had fun decorating the shoeboxes before filling them.